Portofino includes opulent trims, embroidery, and rhinestone accents. The large-scale jacquard design has a luminous golden gleam within a field of chocolate and silver-blue mixes to form a palatial retreat. Custom trims add a unique look to this bedding. 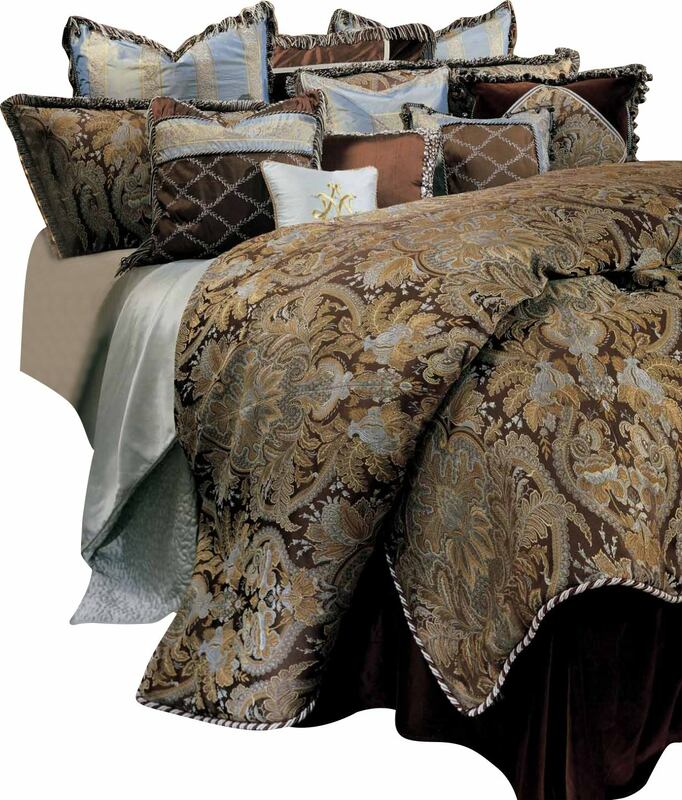 The embroidered Euro shams have surrey bullion and beaded trim. In the king set, the third Euro sham is chocolate velvet with faux silk and gimp accents. The unique decorative pillows add a touch of glamour to the bed. The comforter reverses to a coordinating stripe adding value. The shams reverse to chocolate velvet. This set is available in either a 13-piece King set, or a 12-piece Queen set.